A "League of Nations" competition intended as a third major tournament for European countries after the World Cup and European Championship has been given the go-ahead by Uefa. The competition, which starts in September 2018, will also provide four qualifying spots for Euro 2020. Uefa is still finalising the details but there will be four divisions, sub-divided into four smaller pools. The top division's four pool winners will then play each other in June 2019. There will be promotion and relegation between divisions. The tournament will replace most international friendly fixtures, with pool matches played between September and November 2018 and the 'final four' competition played the following summer. The opportunity to qualify for the European Championships is intended to make the League of Nations competitive. The best four teams in each division who have not already qualified for Euro 2020 will play off for the final four places in the tournament. "Twenty teams will advance from the qualifying competition to the Euro 2020 finals - which are being played in 13 cities around Europe," Uefa general secretary Gianni Infantino told delegates at the authority's Congress in Kazakhstan on Thursday. "That leaves four extra slots to be filled and they will come from four teams from the Nations League who have not otherwise qualified." On current ranking, England would be in the top division alongside the likes of Spain, Germany and Italy. Each division would then be divided into pools of three or four teams, with the winners of each pool qualifying for a semi-final and final, played at neutral venues. Scotland, Wales and Northern Ireland - ranked 31, 34 and 39 respectively by Uefa - could find themselves playing each other in the third or fourth divisions using the current national team coefficient. 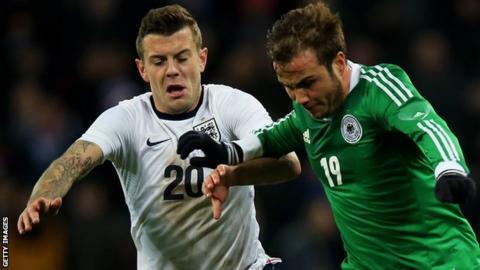 Fifpro, the world footballers' association, is concerned about the added strain it will place on players. "It should be clear that there is a difference in a friendly match and a competitive match," said director of player services Tijs Tummers. "The Nations League will be another prestigious competition. As a consequence, that implies an increase in the workload for the group of top players." While matches will be played on dates reserved for friendlies, there will still be flexibility for smaller countries to arrange high-profile fixtures with bigger European teams and for nations to play friendlies against national sides from outside Europe. Scotland's FA is in favour of the new format and performance director Mark Wotte told BBC Scotland: "Friendly games are only interesting if you play world-class opponents. "It is a good proposal, it is something new, it is worth a try and we have a couple of years to prepare for it." The Football Association in England has also backed the plan, with chairman Greg Dyke saying earlier this month: "The hard thing is the detail, but I think a Nations League where we played the top nations would be very attractive."